The Continent has always seemed a place where speed limits for drivers are higher. Tourists have felt fairly immune, since they'll soon be back home and out of the jurisdiction of the police force, and there's no agreement between many countries for enforcing fines. But in France you're no longer as free to speed as you once were. Under new laws, foreign-registered cars caught by cameras speeding in France will be recorded on a national register - not good news if you're planning on visiting regularly with your car. Speeding can mean an on-the-spot fine of up and if you don't have it, the police can keep your vehicle until you come up with the cash. If you're caught going more than 50kph (31mph) over the limit, your car can be confiscated. Anyone caught going more than 25kph (approx 16mph) over the limit can lose their licence on the spot. You need to carry your driving licence, the V5 vehicle registration document, and a current certificate of car insurance. In case you need to stop for an emergency you need either working hazard flashers or a warning triangle. Since it's the law, you also have to carry a spare set of light bulbs. Remember too that the drink-driving limits are stricter than they are in Britain. You're classed as over the limit if you have more than 50 milligrams of alcohol per 100 millilitres of blood (it's 80 mg in England). Another rule to remember whilst driving in France is NOT to use your mobile phone at the wheel (just as you wouldn't in the UK) drivers caught doing this will be fined on the spot, usually €130 (£109). Radar traps are frequent, and urban speed limits start at the town sign (be very aware that those don't always coincide with the 50kph signs, so you need to keep your eyes open). There are two sets of speed limits in France, one for dry weather, the other for wet. If it's less than two years since you passed your test, the lower wet weather limits apply at all times. British drivers, though, aren't the worst speed offenders in France. According to statistics, that honour belongs to the Germans, followed by the Spanish and the Dutch. The British are responsible for only 8.5% of all motoring offences committed in France. When Travelling Abroad, you need to remain very aware of your speed at all times, and familiarise yourself with exactly where the limits change to avoid problems. 'Course you did, @Stomp! French police have no jurisdiction or other legal means to add points to or cancel a British driving License (despite what Brexiteers would probably try to claim). You could have got a fine or even a prison sentence for dangerous driving, but they still can't touch your UK license. With respect, you need to distinguish between Britain and England. English drink drive law is 80mg/100ml but in Scotland it is the same as France at 50mg/100ml. (Since 2014). Lost my licence . French coppers hidden, on private land just before end of sign for village. After a long time stuck behind a swaying french reg van I overtook on a dead straight 2km stretch . One house on left followed by just fields. But it was a foreign car , I have (had) a uk spotless clean licence. If your not french you are a target and they take great pleasure in catching you . I was literally just before the sign leaving a village . I don't speed but I did. There is no logic or fair play here just a means of creatingrevenue. I just got hit with 4 speeding fines from our holiday this summer! I drive in France every year and this was a real shock. All under 10% over the limit but still that's 4 x €45 I wasn't expecting to have to pay. It was a hire car - what are the chances of them coming after me if I don't pay? Hey, first of all, sorry for my bad English. I just received a fine because I cross the speed limit with 1km/h. Really 1 km/h an it cost me 45 Euros. Should I pay this or no? THIS IS VERY GOOD FOR THE DIFFERENCE BETWEEN UK AND FRANCE SPEED LIMITS I THINK YOU NEED MORE SIGNS FOR DIRECTIONS, MUST I USE MY GPS FOR HELP.
" only 8.5% of all motoring offences committed in France." I am not sure why the "only" stands there, this 8,5% is actually a lot for the UK... It "only" leaves 91,5% percent for the 70 million locals + non-UK foreigners ! Shouldn't that be km/h or Km/h (and not kph)? I'm driving a Laguna hatchback , to creat more space in the car for luggage ect can I remove the rear seats ? 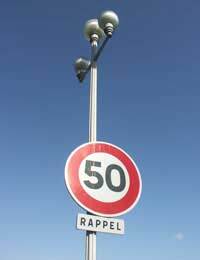 It should be stressed that the 50 kph limit starts at the red-bordered sign showing the town's name.Even the majority of English ex-pats living in France don't know this and sail through small villages at 90 kph only slowing if there's a 50 RAPPEL sign which is a reminder that you are already in a 50 zone.